President Bush has been lying in state in the Rotunda of the U.S. Capitol since Monday evening. Together in the cathedral front row were President Donald Trump and first lady Melania Trump. along with former presidents Bill Clinton, Barack Obama and Jimmy Carter, along with their wives. Prince Charles of England, German Chancellor Angela Merkel and Jordan’s King Abdullah II were some of the foreign dignitaries slated to attend. About 3,000 people filled the cathedral. After the funeral service, Air Force One — temporarily renamed “Special Air Mission 41” in honor of the 41st president — will return Bush’s body to Texas for burial, where a second private funeral is scheduled to take place. 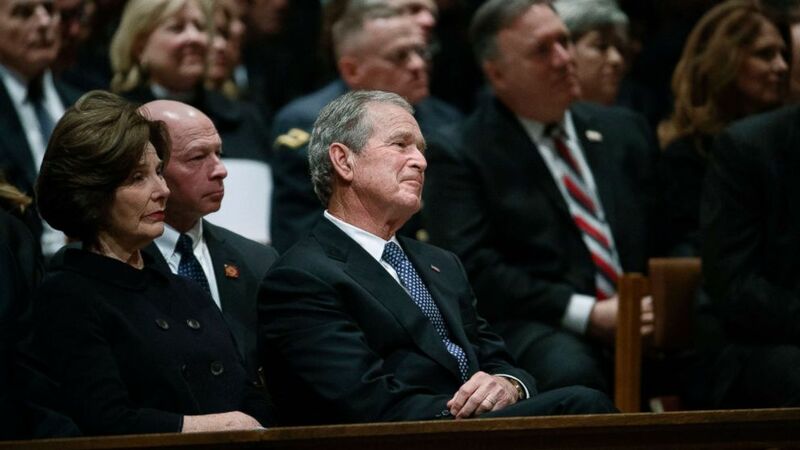 Former President George W. Bush delivered a poignant eulogy of his father President George H.W….